Intravenous adenosine is the first line drug for termination of supraventricular ventricular tachycardia in infants and children. The latest edition of the Royal College of Paediatrics and Child Health (RCPCH) publication, Medicines for children, recommends an initial dose of 50 µg/kg followed by increments of 50 µg/kg up to a maximum of 300 µg/kg in infants and 500 µg/kg in children.1 Current Advanced Paediatric Life Support (APLS) guidelines recommend incremental doses of 50, 100, and 250 µg/kg.2 The Pediatric Advanced Life Support (PALS) guidelines recommend a first dose of 100 µg/kg followed by a second dose of 200 µg/kg if necessary.3 Because of these varying recommendations, we investigated the success of various doses of adenosine in terminating supraventricular tachycardia in infants and children in our population. We conducted a retrospective review of consecutive infants and children with supraventricular tachycardia referred to this unit between January 1998 and May 2003, where intravenous adenosine was given in the local paediatric hospital prior to discussion with, or referral to, this hospital. Adenosine was given to 35 patients (23 infants and 12 children) with 53 episodes of supraventricular tachycardia. Details of the initial dose of adenosine and all subsequent incremental doses administered in the local paediatric department were obtained from local hospital patient records, and the success in terminating in tachycardia was noted. Body weight was recorded and doses were adjusted to µg/kg. The study was approved by the Newcastle upon Tyne Hospitals NHS Trust Research & Development Directorate. Adenosine was given to 23 infants with 32 episodes of supraventricular tachycardia. Their ages ranged from 1 to 72 days. 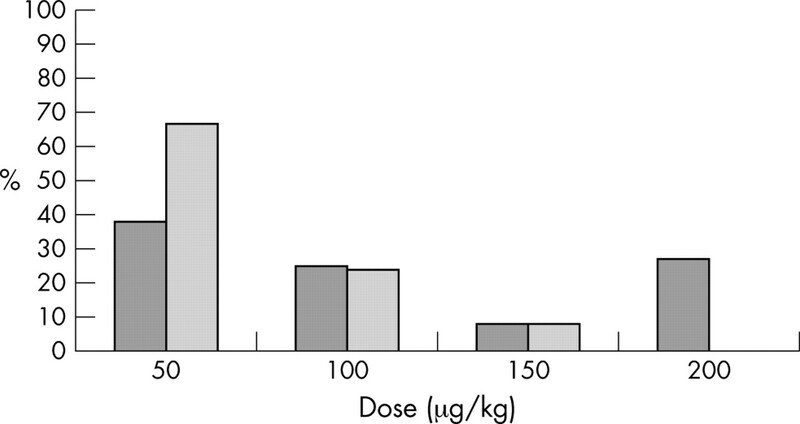 The initial dose given was 50–200 µg/kg with a median of 100 µg/kg and a mean of 115 µg/kg (fig 1). A dose of 50 µg/kg was effective in only 9% of patients and 150 µg/kg was effective in 35% of infants (fig 2). The median effective dose was 200 µg/kg. There were no significant complications associated with adenosine administration. Proportion of infants (dark grey bars) and children (light grey bars) receiving stated doses of adenosine. Cumulative efficacy of adenosine in terminating tachycardia in infants (grey line) and children (black line). Error bars show 95% confidence intervals. Adenosine was given to 12 children with 21 episodes of supraventricular tachycardia. Their ages ranged from 17 months to 15 years and the initial dose ranged from 50 to 150 µg/kg with a median first dose of 50 µg/kg and a mean of 73 µg/kg (fig 1). 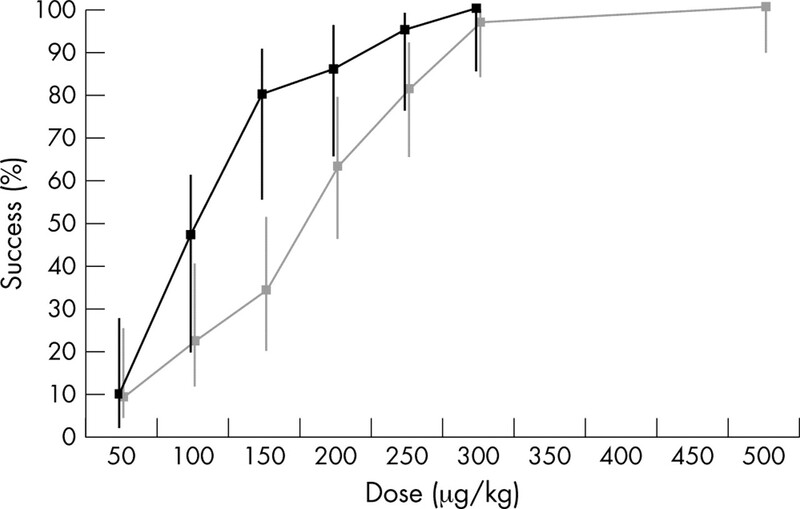 The effective dose ranged from 50 to 300 µg/kg (fig 2). A dose of 50 µg/kg was effective in only 9% and the median effective dose was 150 µg/kg. Tachycardia was terminated in all patients. Minor side affects were observed but not analysed. No significant adverse affects were recorded. Adenosine is widely accepted as the first line treatment for supraventricular tachycardia in infants and children but current guidelines offer confusing advice about dosage. Early reports used experimental protocols with starting doses of 37.5 µg/kg4 and 50 µg/kg.5 Overholt and colleagues4 reported a mean effective dose of 114–131 µg/kg depending on the precise diagnosis, and Till and colleagues5 found a median effective dose of 150 µg/kg. Despite this, current protocols advise starting doses of 50 or 100 µg/kg. Our study has shown that a dose of 50 µg/kg is effective in <10% of infants and children and 100 µg/kg is effective in <25% of infants and <50% of children. A dose of 150 µg/kg is more effective in children (around 80%) than in infants (around 35%). This difference may be explained by the difference in weight to body surface area ratio and there might be little difference if adenosine was prescribed and administered in mg/m2 rather than µg/kg. Other possible explanations for the lower response in infants include smaller cannulae limiting the injection rate and the fact that babies tend to be more ill at presentation and may have prolonged circulation times. Other studies have shown the lack of efficacy of small adenosine doses: Sherwood and colleagues6 reported a 16% response to 50 µg/kg and Losek and colleagues7 showed a 22% efficacy for doses of up to 100 µg/kg. The latter report also showed that significantly more doses need to be administered when the first dose is low. One danger of too low a starting dose is that parents and paediatricians lose confidence in what is a very effective drug. We and others have found no significant adverse affects when giving adenosine in therapeutic doses. We conclude that the current recommended starting doses of adenosine are too low. It seems inappropriate to give a dose which has a less than 10% chance of being effective. The minimum dose ought to be no less than 100 µg/kg in children and 150 or 200 µg/kg in infancy. RCPCH. Medicines for children, 2nd edn. London: RCPCH Publications Limited 2003. Mackway-Jones K , Molyneux E. Phillips B, Wieteska S, eds. Advanced paediatric life support.The practical approach, 3rd edn. London: BMJ Books, 2001. Anon. ECC guidelines. Part 10: Pediatric Advanced Life Support. Circulation2000;102 (suppl I) :I291–I342. Overholt ED, Rheuban KS, Gutgesell HP, et al. Usefulness of adenosine for arrhythmias in infants and children. Am J Cardiol1988;61:336–40. Till J , Shinebourne EA, Rigby ML, et al. Efficacy and safety of adenosine in the treatment of supraventricular tachycardia in infants and children. Heart1989;62:204–11. Sherwood MC, Lau KC, Sholler GF. Adenosine in the management of supraventricular tachycardia in children. J Paediatr Child Health1998;34:53–6. Losek JD, Endom E, Dietrich A, et al. Adenosine and pediatric supraventricular tachycardia in the emergency department: multicenter study and review. Ann Emerg Med1999;33:185–91.